My humble question is if peaceful will not work to create sane economics, then what will? That is why we believe only the opposite of insanity will work and that is intelligent deliberative direct democracy. Let us hope everybody will begin to realise this very soon. It is always lovley to have you here. Today I had the pleasure to see a very good interview made by Paul Jay from The Real News Network. The demonstrators on Wall street want to change the economy, the bank system and have created general assemblies that exercise direct democracy. Paul is in an interview at Wall street together with a man that knows what he wants and is worth listening to, in my opinion, even if the things he is prescribing has to be analysed deeper and not too fleetingly. He talks about voting and public discourse and creating an informed citizenry able of critical thinking. This is right up our alley. This man is most wellcome to become a member of our Intelligent Union network if he decides to do meditation as well. Congratulations all people in the USA. I love you all. Your most needed revolution against financial fraud is spreading. Here comes my support from Sweden, where nothing about this in our own controlled news. I guess our secret censorship has gone far enough now? Thankfulness for the American soldier trying to wake up the police so that they join the USA-side instead of working for the banksters. Even if a few assholes still follow the banksters orders trying to make it slightly more difficult could actually be helping you. Hot food is not as effective and healthy as you might think, actually. I want to inform you all that there are good warm clothes and sleeping bags and that dried fruits and nuts ar tasty and will keep you going in the coldest conditions imaginable. Raw vegans like Bill Clinton can probably tell you about the benefits too if you do not believe me. If the police gets violent it could be swifter than a long winter though, because the police breaking your constitutional rights gives you the moral and maybe even the legal right to act with more power, in my opinion, and guns are not lacking in the USA. But ask the police to stand down first! Give them a chance to join you or at least survive when you are upholding your constitution! Be as gentle as you possibly can! The police might be less intelligent sometimes, but they also work for you most of the time. All protesters are hoping that the police also soon will wake up and realise that the constitution has to be defended from the criminals that hijacked their country and now will lower their salaries and pensions too and even make their president look bad by putting their country in huge deficit. The police has to uphold the constitution and begin to arrest the ones who give them orders to go against it! Nothing is more reasonable than that actually. USA needs a new democracy, in my opinion, and he police has to understand that the constitution and the people stands above any other laws. I am sure they eventually will understand this and I am grateful for that. It is just a question of time. Thankfulness. Intelligent deliberative democracy by the people would be nice for all in the USA including police and military. Your common enemy are the banksters and the politicians that did not yet have the courage to arrest them or restrict them, the ones applauding these guys more than your elected president are the guilty ones! My advice is that you form a new political party directly controlled by the people through a committee that keeps it intelligent enough and then present it in the next election. Democrats not joining an intelligent deliberative direct democratic movement are not real democrats and should be considered to be conservatives. I recommend that you put this man in charge, a fighter for a better democracy and jewish too so they cannot play the anti-Semitism card against you when you replace a lot of these greedy bastards. 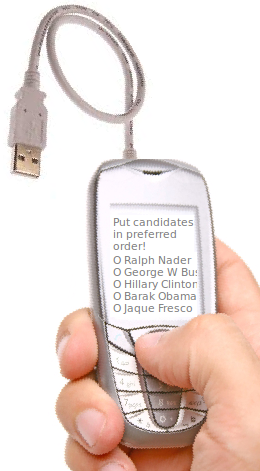 What is a “dedicated trusted computer voting device”? Is online voting safe enough? Intelligent Unions answer is unfortunatly “no”. It is not safe enough in general, but there is a way to make it safe enough. The reason for uncertainty when voting over the internet is called “trojan horses“. A “trojan horse” is a programs that can be installed on your computer without your knowledge, just like a virus. The trojan horse will however not be seen or do anything that will raise your suspision. The trojan horse can simply manipulate what is sent and recieved. It can show you what you want to see and do something completley different with the data that is beeing sent from your computer. To make online voting safe enough you must use a “Dedicated trusted computer voting device“. This is a gadget that is connected to the PC via USB (not wifi) and it is very crude and easy to inspect if nesseccary. The gadget uses highest possible level of encryption. Aktiv Demokrati is a Swedish direct democratic political party that seems to have dismissed the idea of adequate safety for online voting even though independent engineers with knowledge have intrestingly pointed out the importance of secure online voting using a “Dedicated trusted computer voting device“. There are more things needed to make e-democracy safer in other aspects too naturally, like for example open database and using safer operating systems, but the weakest point is usually the clients. Please vote for parties that do suggest more direct democracy but only if they do take reality of safe voting seriously! The oppsite can not bee seen as very intelligent. In Intelligent Union we can clearly see this need for safety and we will promote standard democracy with increased regular direct democratic voting until we have managed to make this little gadget into intelligent people’s democratic toy. In ancient Greece, 594 years before Christ, the people gathered, and they created an intelligent union of people, and we can do it again. Most of us have ten fingers. Maybe you would like to fold nine of your fingers, or maybe even eight, and let the long fingers stand there as a protest, a protest against something that is not quite right, but this actually leads nowhere. Therefore, I choose instead to relax, to breathe deeply and slowly. I choose to fold seven and then six fingers and dream of a more intelligent community with a warm smile. Yes. I feel that there is hope. There is a hope of a “V” as in “Victory”, and it’s all about you. And five people are actually more than four. Yes. You are important. And if you want to see the truth, and if you want to feel totally relaxed at the same time, you have to actually have the courage to look inside you with full insight, and do what is right with a sense of courage. The feeling of love and courage is a great feeling! If, for example, we see three people in front of us at a table, and two of these people have their own glass of water. And if we see that two people have the courage to share this water with the person who has no water, then it feels good. I believe most of us agree deep inside that this is something good. But if this human warmth is to happen in real life, in politics, in the world, we must organize now. In an intelligent union of people, we actually have to start voting more intelligently. Because if we want a society, where everyone can feel secure when the cold wind comes in, and if we want a society where everyone wants to interact, we must also look at ourselves, deep inside ourselves. Yes. We must become more intelligent and see the big picture! It’s all about you. You are already intelligent in different ways, and if you develop and refine your thinking ability, you will be super intelligent with us. What you must realize with insight about yourself is, that we can all become much more intelligent through an intelligent union. And in the same way as cells in a human body, which work together and give each other power, we can also, all together with nature, benefit from each others’ abilities. And if we all contribute positively to a healthy balance, we will all benefit from it. I have a dream of an intelligent society. I have a dream of united ordinary men and women – entrepreneurs and workers, students and soldiers, farmers and teachers, nurses and janitors, engineers and retired. I dream of creating a more intelligent life, which you and everyone can benefit from simultaneously. Yes. You can join in and make the rule by the people more mindful now. I have a dream of a country where people create peace and intelligent rule by the people. I have a dream to be proud of you and my country. That’s why I stretch out my hand to you today, and hope you will give me a powerful hand with your special ability. It does not matter what party you are voting for today, or what ability you happen to have. There is hope for an intelligent rule by the people. I think we all hope for that. This applies to all parties. It applies to the Pirate Party and the Feminists, to Democrats and the Green Party, to Social Democrats and the Centre Party, to Christian Democrats and the Socialist Party, but also to Communists, Conservative and the Liberal Party, and also to you. Now is the time, to take our moral responsibility seriously, and give every child an education that gives children the ability to feel whole, to have the courage to choose and the ability to think independently. Now it’s the time, for sympathy to become part of democracy. When used correctly, this super intelligent sympathy, can provide a security that gives motivation and power to all, a power that contributes positively to everybody and to our society. Now it’s time for us to change our laws so that the old woman’s pension can be secured before the CEO:s bonuses, and it is time that women and men are treated equally. Now is the time to encourage refugees, who fled dictatorship and corruption, and help them to new courage. For it is time that we organize ourselves and create an intelligent democracy together across the world. For everyone who has intelligence must stand up with pride, seeing his fear and meet it with courage in every moment. For the sweetness of the banana and the sourness of the lemon is not on the outside of the fruit. The flavor is inside and you choose the flavor you want to have. Because it’s about your attitude to yourself and about your own actions. And that is why we have every reason for a positive attitude in every moment. We must also ensure that those who fought for democracy and human rights are given refuge if needed. And you who enjoy the rights we struggled for, over the past century and you who have shown courage and pride in your country and you who pushed for democracy and actually entered the struggle, Yes you, yes, you actually have a place in our democracy. Because if you want peace and freedom, if you want more insight, and the right to independent thinking, yes, if you want an objective discussion and a real democracy, then there is hope of a secure future for you and all of us together. But it requires you to wake up gradually and become an intelligent awake human being, you will be a human that also help others to wake up.